Restaurant 1914 at Alhambra Theatre01274 431052work RestaurantMake your trip to the theatre even more special with a meal in our restaurant. 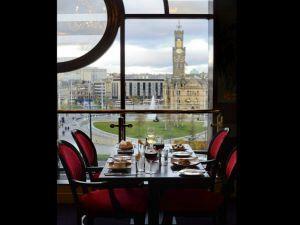 With views over City Park and a seasonal menu full of tempting dishes, it's the perfect spot for a pre-show bite to eat.This restaurant, located on the Upper Circle level of the Alhambra Theatre, is open on performance days at the Alhambra only:matinees from 12.00 and evenings from 17.00. Make your trip to the theatre even more special with a meal in our restaurant. With views over City Park and a seasonal menu full of tempting dishes, it's the perfect spot for a pre-show bite to eat.This restaurant, located on the Upper Circle level of the Alhambra Theatre, is open on performance days at the Alhambra only:matinees from 12.00 and evenings from 17.00. The restaurant is open on performance days only: matinees from 12noon and evenings from 5pm. To make a booking please call 01274 431052.